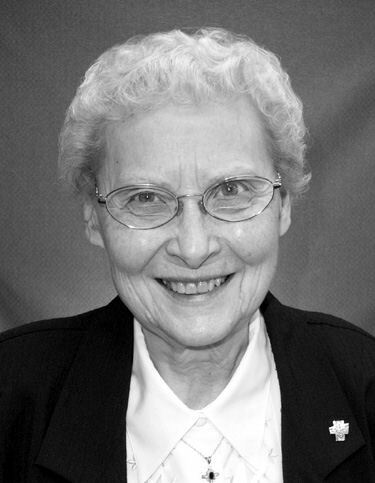 Sister Mary Pierre Kollasch, PBVM, 94, died on Sunday, March 31, 2019 at Mount Loretto Motherhouse, 2360 Carter Road, Dubuque IA. Funeral Services will be Wednesday, April 3, 2019 at 10:30 am at Sacred Heart Chapel, Sisters of the Presentation, with burial in Mt. Olivet Cemetery, Key West. Friends may call from 4:00-7:00 pm on Tuesday, April 2, 2019, at Sacred Heart Chapel, where there will be a vigil service at 7:00 pm. Sister Mary Pierre, daughter of Peter and Gertrude (Koehn) Kollasch, was born Loretta Anne Kollasch on April 29, 1924 in Whittemore, IA. She entered the Sisters of the Presentation on September 15, 1945 and professed her perpetual vows on May 3, 1951. She received a BA degree in Education from Loras College, Dubuque in 1957. Sister Pierre’s ministries took her to Humboldt, Waukon, Clare, Charles City, Mason City, Lawler, Epworth, Bankston, and Dubuque Resurrection (1981-1984), all in Iowa where she taught grades K-3. In addition to teaching, she served as the coordinator of personal care at Dubuque’s Villa Raphael, retirement home for priests, where she ministered for 15 years. Following that position she came to Mount Loretto as head baker at the motherhouse. This new ministry brought her full circle to her earliest ministry dream to help sisters who served in domestic roles to become more connected to their community. With her box full of delicious recipes, her dedicated service and loving care over 70-plus years of religious life, the result is hospitality in the spirit of Nano Nagle that was embodied in Sister Pierre. She retired to Mount Loretto in 2000 and celebrated her 60th Jubilee in 2006. Sister Pierre enjoyed baking her treats, playing cards, visiting, reading, a good movie, and community service. In quiet moments she enjoyed her extended prayer time. Surviving is her brother, Arthur, nieces, nephews, and the Sisters of the Presentation with whom she shared her life for 73 years. She was preceded in death by her parents, her brother, Bernard, and her sisters Alvina Elgersma, and Mary Thompson. The Leonard Funeral Home is in charge of arrangements. Memorials may be made to the Sisters of the Presentation, 2360 Carter Road, Dubuque, IA 52001 or online at: www.dubuquepresentations.org.